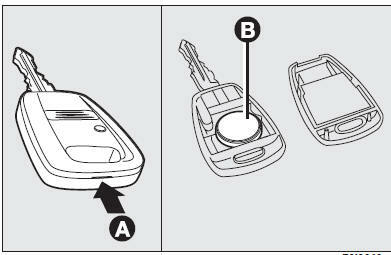 the switch to deactivate the passenger’s air bag (where provided). Button (F) operates remote door locking/unlocking. Led (E-where provided) comes on when sending the control to the system receiver. When unlocking the doors, the internal lights will come on for a preset length of time. IMPORTANT Certain radio devices outside the car (e.g. mobile phones, HAM radio systems) could disturb the remote control frequency. In this case the remote control could malfunction. If when pressing the remote control button, the led on the key flashes briefly only once, the battery should be replaced with an equivalent one that can be purchased at common stores. The system can recognise up to 8 keys with incorporated remote control. Should a new key with remote control be necessary, contact a Fiat Dealership, taking with you the CODE card, a personal identity document and the car’s ownership documents.